Tsubakura Enraku in Brilliant Pagoda or Haze Castle. Composed Heaven & Shadow War Record ~ Playing Soldiers from Brilliant Pagoda or Haze Castle. 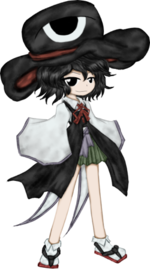 JynX (ジンクス, Jinkusu, pseudonym) is a Japanese game developer who has become well known for their remakes of stages from the PC-98 Touhou Project games, although these stages are usually only shown as teaser videos and never actually released to the public. They are the creator of the Len'en Project, a series of games inspired from the Touhou Project, which they have released to the public as free downloads. Not much is known about JynX. It's known that they like to drink, eat, bathe and sleep. They are also able to cross their toes without using their hands. They run their own doujin circle, Trick Nostalgie, and a blog named Unreal Indolence Record. In the games, JynX uses an underscore rather than an ordinary space when writing in English (compare Brilliant_pagoda_or_haze_castle to the correct Brilliant Pagoda or Haze Castle on their blog). As of 3rd Feb 2019, JynX's favourite Touhou character is Rin Kaenbyou (Orin) . ↑ "Hmm~~~~~~~~~~~~~~~. I've been liking Orin recently. I won't say much about it, nya."